A Conservative Party candidate has stepped down after a row over his comments, in a newspaper, that Enoch Powell was "right" on immigration. 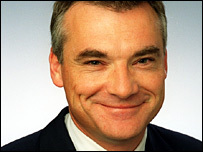 Nigel Hastilow, who was to stand in Halesowen and Rowley Regis, resigned after meeting the Tory party chairman. Party chairman Caroline Spelman said "he chose to resign", adding that it was a "very honourable decision". Labour minister Hazel Blears accused the Tories of "dithering" over whether to sack Mr Hastilow before he resigned. The communities secretary said: "David Cameron has still not condemned Mr Hastilow's words, and he must do so without further dithering." Following her meeting with the former candidate, Mrs Spelman said: "Nigel says in his letter of resignation that he's sorry that his remarks about immigration have undermined the good work that David Cameron has done on this sensitive issue, and also on other issues." She went on: "He himself felt that if these remarks had caused offence, he was concerned, having made a mistake before of this kind as a parliamentary candidate that it might happen again, and he felt himself that it was better that he should go." But the United Kingdom Independence Party (UKIP) said Mr Hastilow had simply been expressing views held by "millions" of voters. Mike Nattrass, who represents the West Midlands area for the party, said: "It is important that this debate on immigration is taken further so we can have an open and honest discussion on this issue." Enoch Powell was sacked from the Conservative shadow cabinet after a controversial speech in 1968 bemoaning the effects of immigration. Mr Hastilow made the comments in a column for the Express and Star newspaper in Wolverhampton - where Mr Powell had been the MP at the time of his 1968 speech. The Parliamentary candidate, a former editor of the Birmingham Post, wrote: "When you ask most people in the Black Country what the single biggest problem facing the country is, most say immigration. "Many insist: 'Enoch Powell was right'. Enoch, once MP for Wolverhampton South-West, was sacked from the Conservative front bench and marginalised politically for his 1968 'rivers of blood' speech, warning that uncontrolled immigration would change our country irrevocably. "He was right. It has changed dramatically." Following his meeting with Mrs Spelman he said he was "very sorry" if his remarks had undermined "the progress David Cameron has made on the issue of migration". He has been in the news before for his outspoken comments - in 2001, when he was the Tory candidate for Birmingham Edgbaston, he wrote on his website that the party was a "lost cause" - and was quoted by then Labour PM Tony Blair in the Commons. In his resignation statement on Sunday, Mr Hastilow said: "I have been here once before when William Hague was party leader and I have no wish to go there again." "So, with regret and my continuing support for the future, I hereby tender my resignation as parliamentary candidate for Halesowen and Rowley Regis. "I thank my friends in the constituency association for their support." Asked about Mr Hastilow's comments earlier, shadow chancellor George Osborne told BBC One's Andrew Marr Show: "Candidates of any party - Conservative, Labour, Liberal Democrat - have to exercise great caution in the language they use about immigration." And speaking to ITV1's Sunday Edition, shadow home secretary David Davis said the comments were "very unwise" and the constituency party should "think very hard" about how they expected their candidate to behave. "You cannot just stumble around throwing out comments which are insensitive or inflammatory," he said. But Mary Docker, chairwoman of Mr Hastilow's local Conservative association, said earlier she did not think he had done anything wrong. She told BBC News 24: "He's basically just raising issues that have been raised with him when he has been canvassing the area. "All he is doing is just relaying the views of the public, which is what a politician should do." Liberal Democrat chief of staff Edward Davey said the incident raised "serious questions, both about the Conservative Party's selection procedures and the views of at least some of their grass roots members".